Pat Dunning, Mike Cippera and I have been close friends for more than thirty-five years. Our deep-rooted friendship has enabled us to understand each other better than the average start-up company’s personnel does. We are all extremely committed to continuing our education in the sports-field industry. We enjoy every time we have an opportunity to step on to one of your fields. This gives us the chance to learn something new, to get an idea or two, and to possibly spread some of the knowledge we have picked up from the last few customers we have visited. We understand that every field has its own set of unique circumstances behind its success or failure. What we find so pleasing about the profession we have chosen is the camaraderie within it. In the many years we spent in the corporate world, we never experienced such a willingness to share knowledge and experiences. The people we come in contact with daily are the first to give us ideas and want us to share those ideas with others, so that everyone has a safer facility and are not making the same mistakes or trying to “reinvent the wheel.” The good ideas we have acquired from our customers have helped us become the company we are today and will definitely be the foundation we continue to build our company on in the future. All three of us have come from backgrounds focusing on customer service. We realize that we are only as good as our customer thinks we are. Without each of you, there would be no Odeys! We do not want to sell a customer any more than they need, or for that matter something they don’t need at all. We want our customers to understand that if we tell them something will work, then it will! We want a long-term partnership with each of you. We feel that by being honest and upfront our partnerships will continue to grow. In addition our company growth has allowed us to build our staff substantially over the past few years. We have developed a passion for what we do and welcome the fast pace and continuing challenges that are required to bring our customers the newest and most innovated ideas available in the sports turf industry. 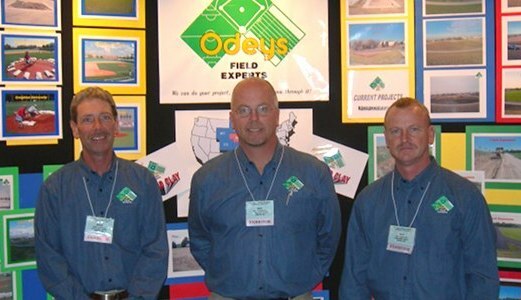 Thanks to each of you for helping mold Odeys into the company we are today!